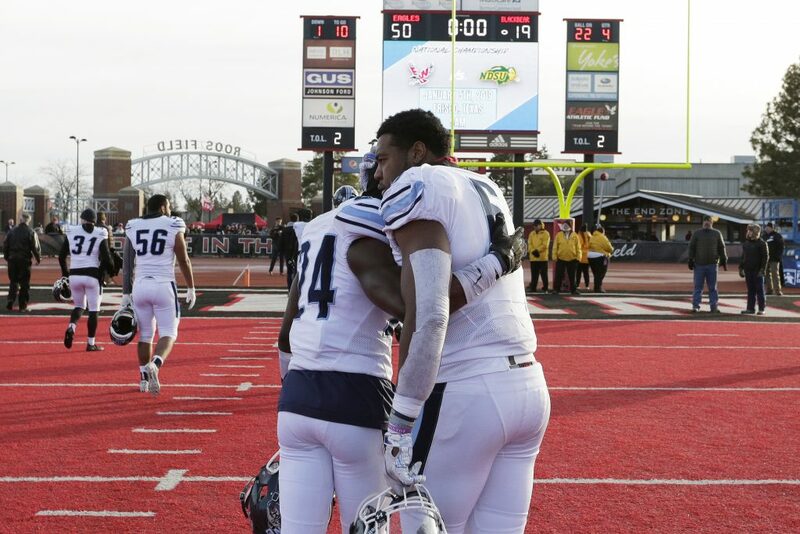 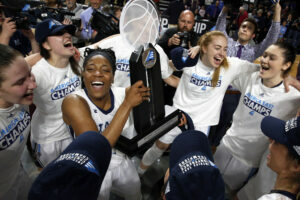 Maine defensive back Katley Joseph, left, and linebacker Sterling Sheffield embrace as they walk off the field after the Black Bears lost to Eastern Washington 50-19 in the FCS semifinals on Saturday in Cheney, Washington. 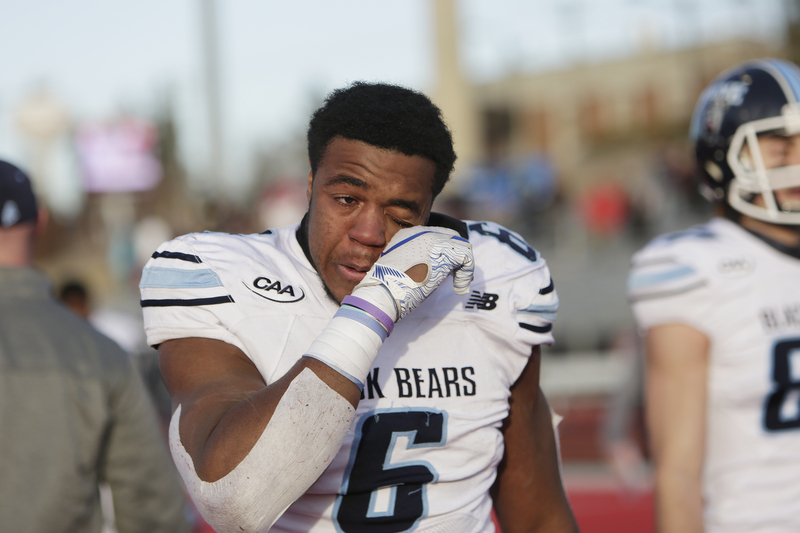 Maine linebacker Sterling Sheffield reacts as he walks off the field after the Black Bears' 50-19 loss to Eastern Washington in the FCS semifinals on Saturday in Cheney, Washington. Eastern Washington defensive back Josh Lewis disrupts a pass intended for Maine wide receiver Micah Wright in the first half of their FCS semifinal on Saturday in Cheney, Washington. 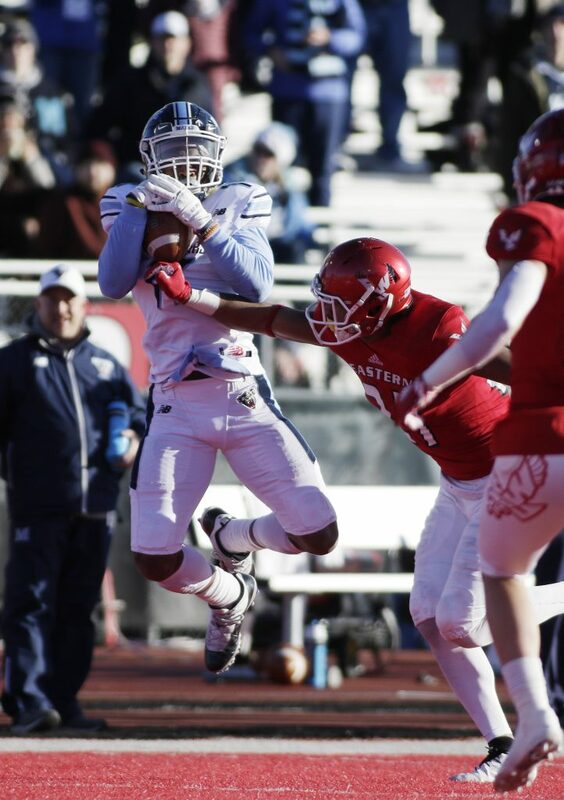 Maine wide receiver Andre Miller catches a pass while defended by Eastern Washington defensive back Nzuzi Webster in the first half of the FCS semifinal on Saturday in Cheney, Washington. 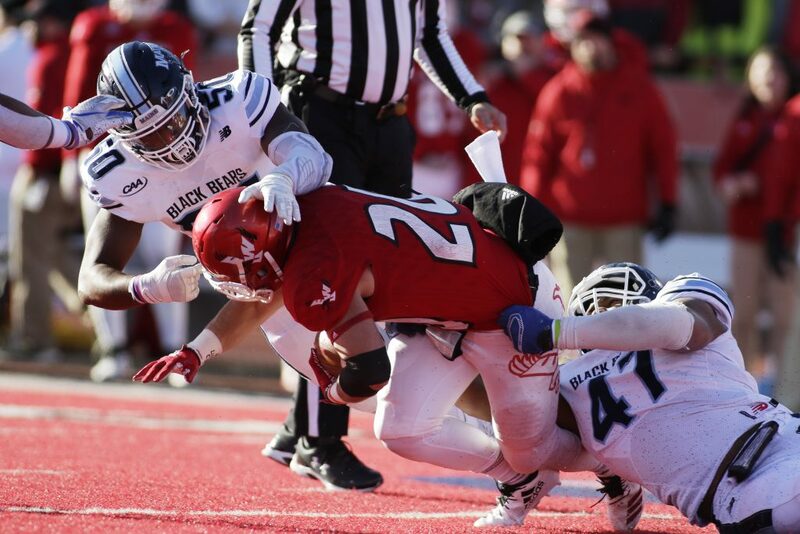 Maine linebacker Taji Lowe, left, and linebacker Deshawn Stevens tackle Eastern Washington running back Sam McPherson during the first half of their FCS semifinal on Saturday in Cheney, Washington. 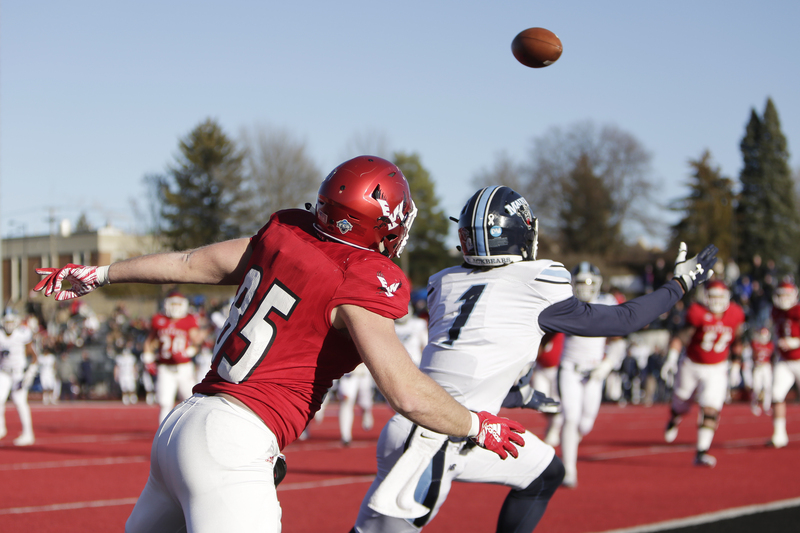 Eastern Washington defensive back Nzuzi Webster, right, disrupts a pass intended for Maine wide receiver Jaquan Blair during the first half of their FCS semifinal on Saturday in Cheney, Washington. 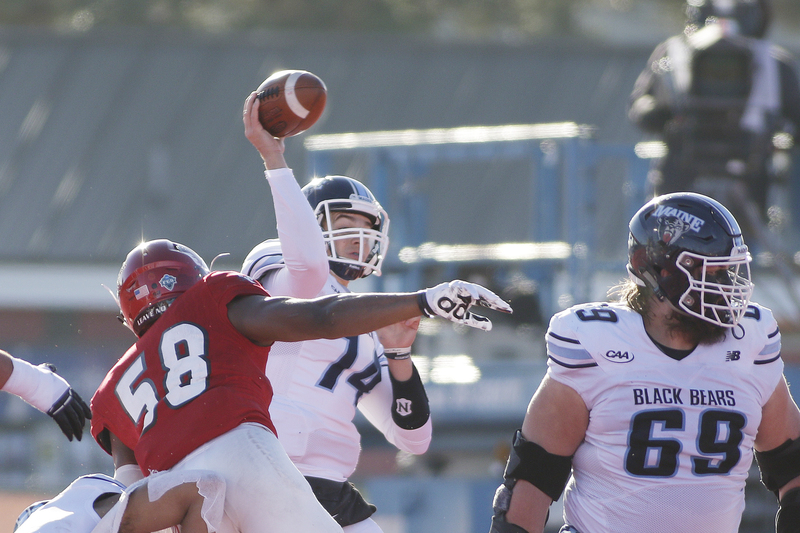 Maine quarterback Chris Ferguson, center, throws a pass during the first half of their FCS semifinal against Eastern Washington on Saturday in Cheney, Washington. 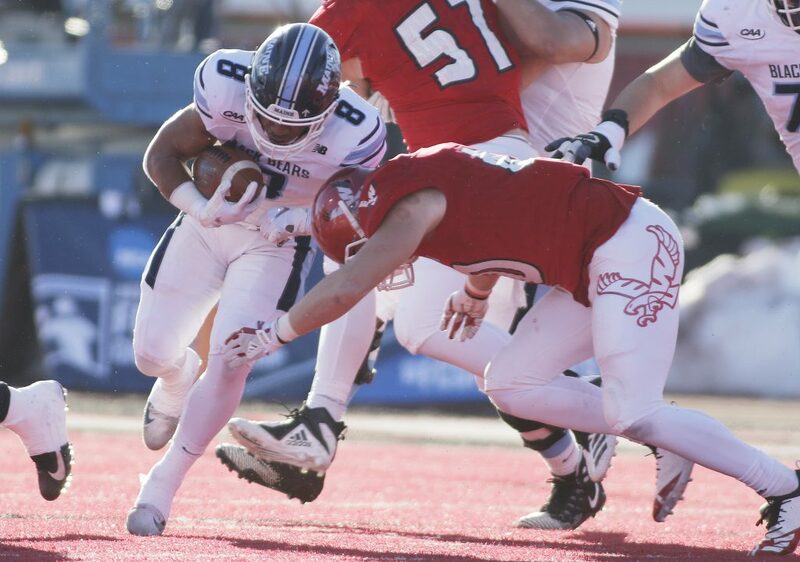 Maine running back Ramon Jefferson tries to avoid Eastern Washington linebacker Ketner Kupp during the first half of their FCS semifinal on Saturday in Cheney, Washington. 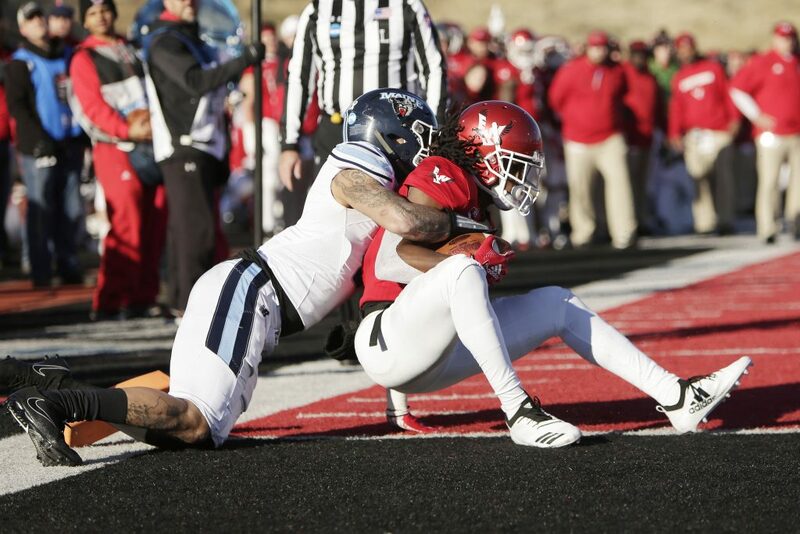 Maine wide receiver Devin Young runs with the ball while defended by Eastern Washington defensive back D'londo Tucker in the first half of their FCS semifinal on Saturday in Cheney, Washington. 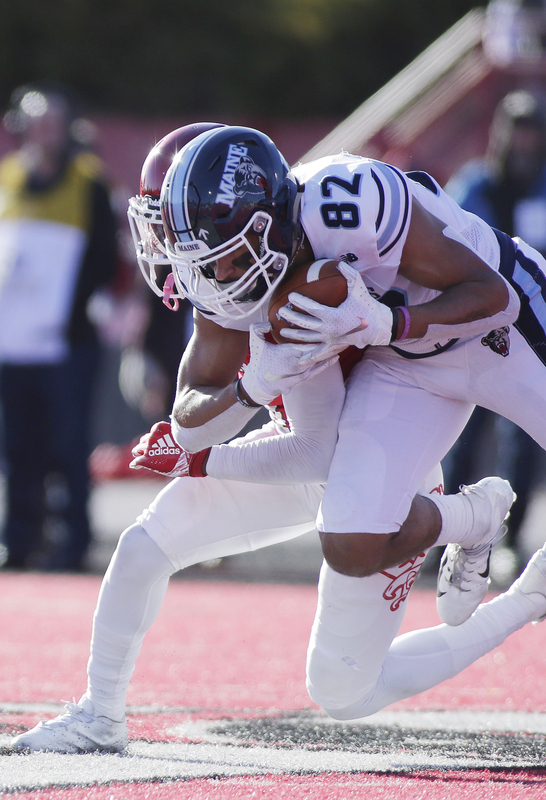 Maine defensive back Manny Patterson steps in front of a pass intended for Eastern Washington tight end Henderson Belk in the first half of the FCS semifinals on Saturday in Cheney, Washington. 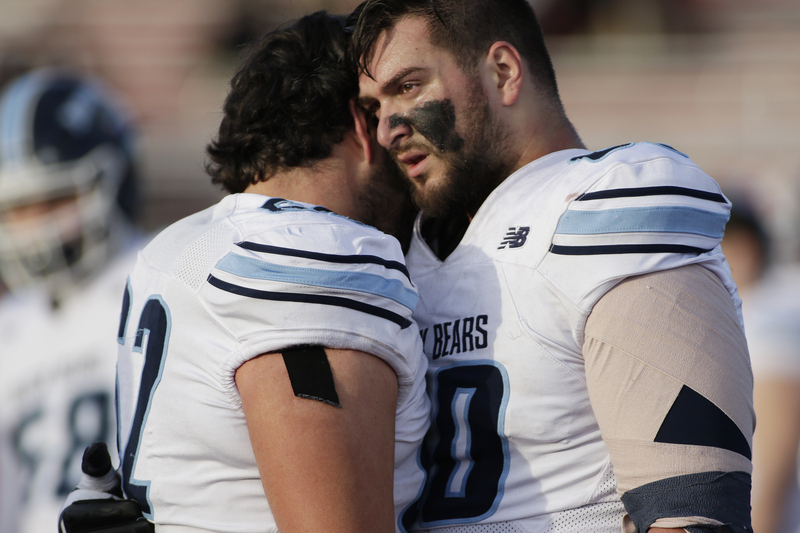 Maine offensive lineman Michael Gerace, left, and offensive lineman Cody Levy embrace towards the end of the second half of the Black Bears' 50-19 loss to Eastern Washington in the FCS semifinals in Cheney, Washington. 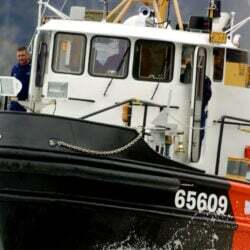  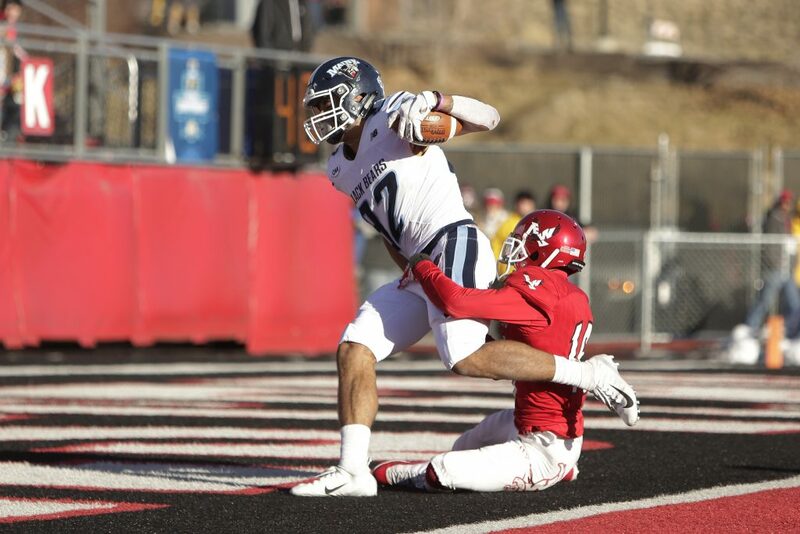 Maine defensive back A.J. 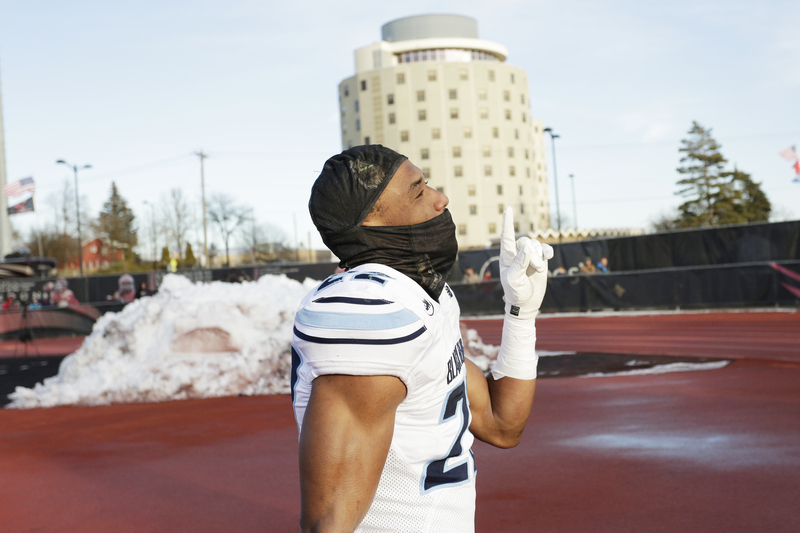 Dawson gestures as he walks off the field after the Black Bears' 50-19 loss to Eastern Washington in the FCS semifinals on Saturday in Eastern Washington. 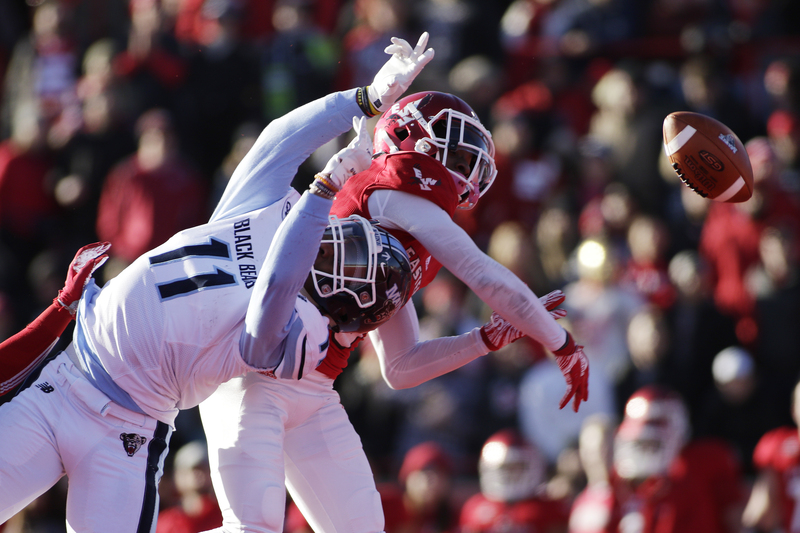 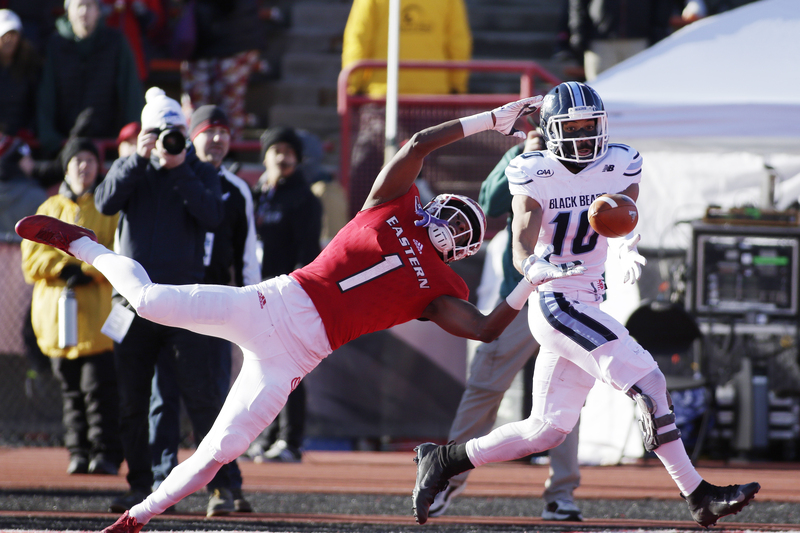 Maine wide receiver Jaquan Blair, left, makes a catch while defended by Eastern Washington defensive back Kedrick Johnson during the second half of the Black Bears' 50-19 loss to Eastern Washington in the FCS semifinals on Saturday in Cheney, Washington. 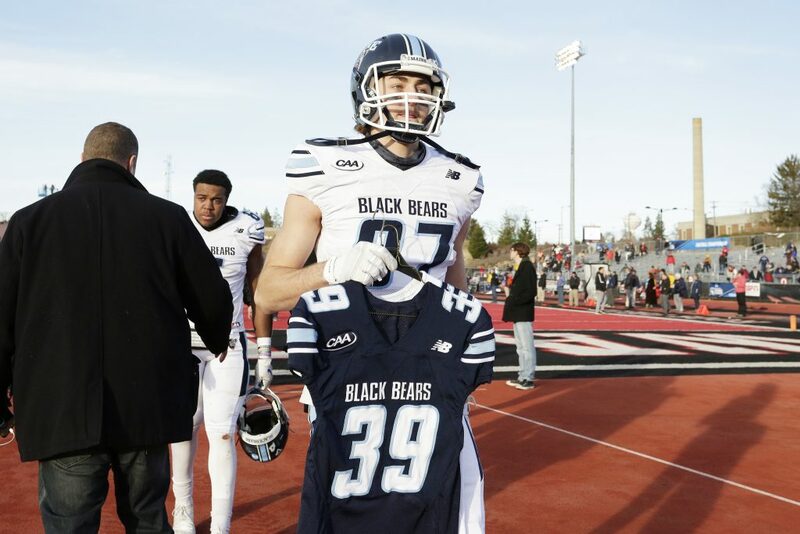 Maine wide receiver Hunter Smith walks off the field with the jersey of Darius Minor, who died of a heart condition after collapsing during a supervised workout in July, after the Black Bears' 50-19 loss in the FCS semifinal to Eastern Washington on Saturday in Cheney, Washington. 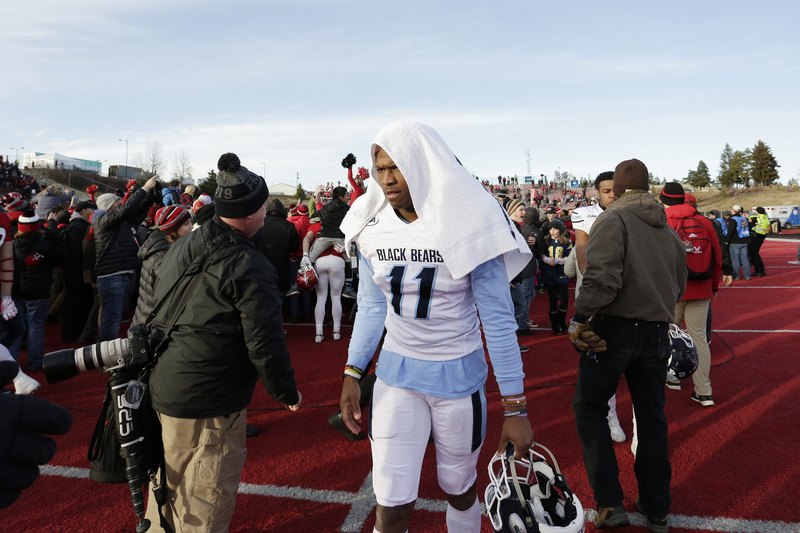 Maine wide receiver Jaquan Blair (11) walks off the field after his team lost 50-19 against Eastern Washington in the FCS semifinals on Saturday in Cheney, Washington. 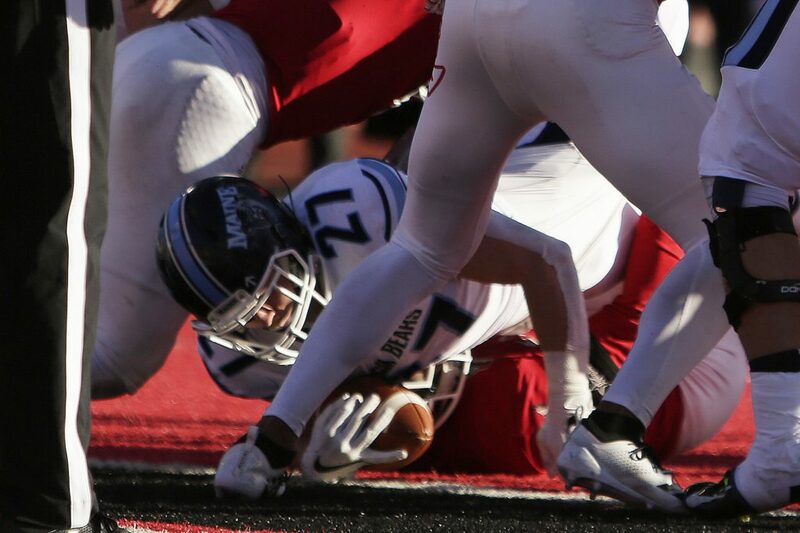 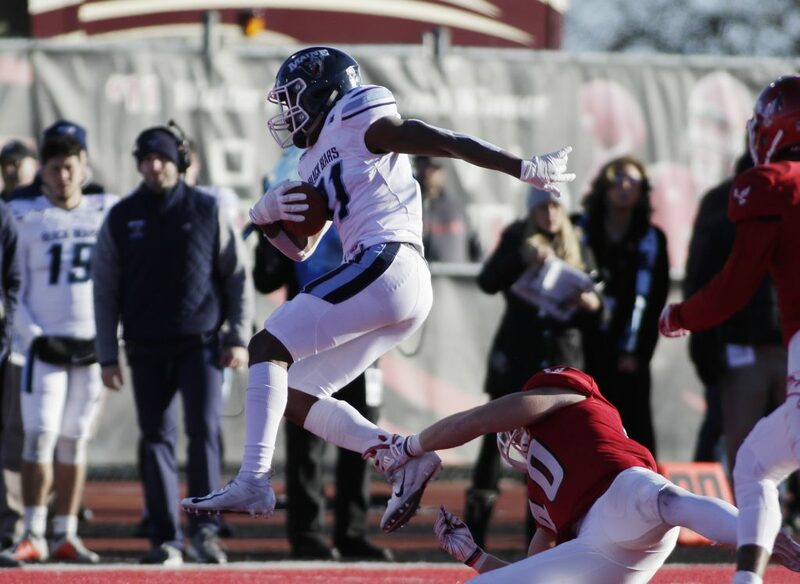 Maine running back Joe Fitzpatrick dives for touchdown during the second half of the Black Bears' 50-19 loss to Eastern Washington in the FCS semifinals on Saturday in Cheney, Washington. 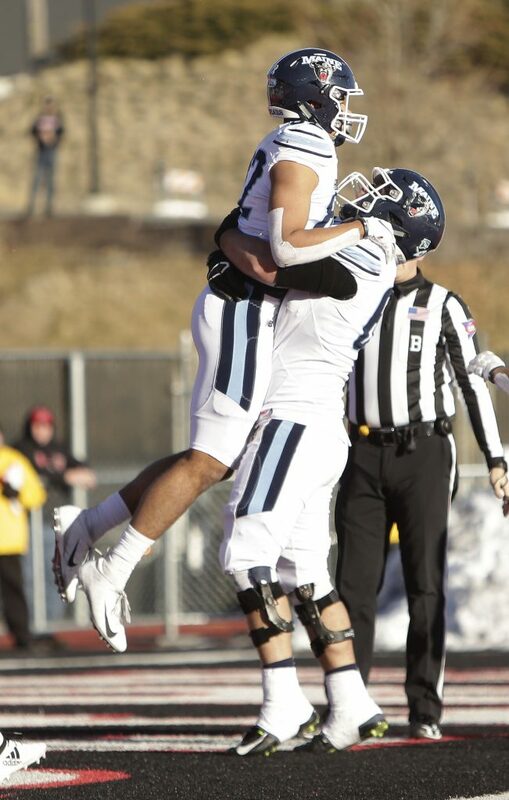 Maine wide receiver Andre Miller, left, celebrates his touchdown with teammate Michael Gerace during the second half of the Black Bears' 50-19 loss to Eastern Washington in the FCS semifinals on Saturday in Cheney, Washington. Maine wide receiver Andre Miller, left, drags Eastern Washington defensive back D'londo Tucker into the end zone and scores a touchdown during the second half of the Black Bears' 50-19 loss in the FCS semifinals on Saturday in Cheney, Washington. 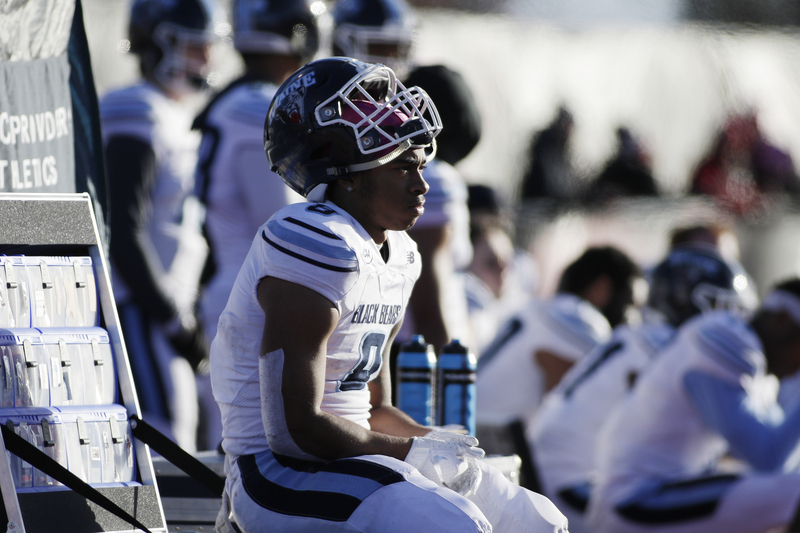 Maine running back Ramon Jefferson looks on from the sideline during the second half of the Black Bears' 50-19 loss to Eastern Washington in the FCS semifinals on Saturday in Cheney, Washington. Maine wide receiver Earnest Edwards, left, avoids a tackle by Eastern Washington linebacker Ketner Kupp during the second half of the Black Bears' 50-19 loss in the FCS semifinals on Saturday in Cheney, Washington. 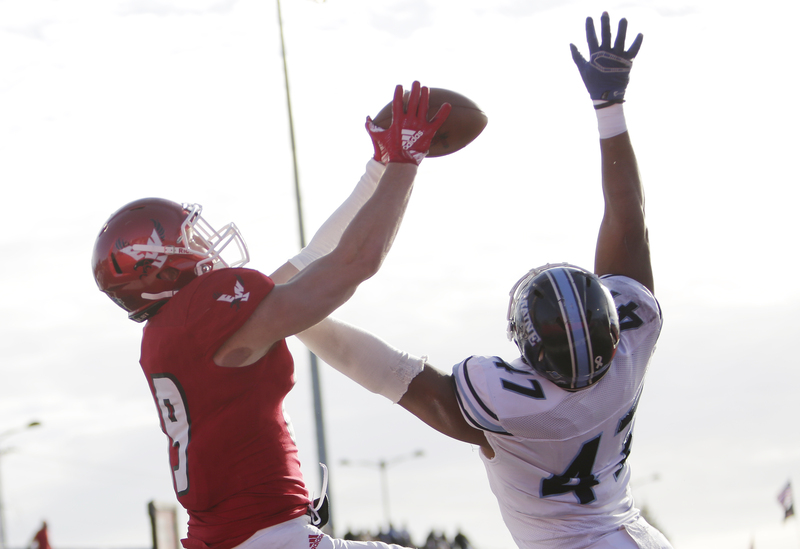 Eastern Washington tight end Jayce Gilder, left, catches a pass for a touchdown while defended by Maine linebacker Deshawn Stevens during the first half of the Black Bears' 50-19 loss in the FCS semifinals on Saturday in Cheney, Washington. 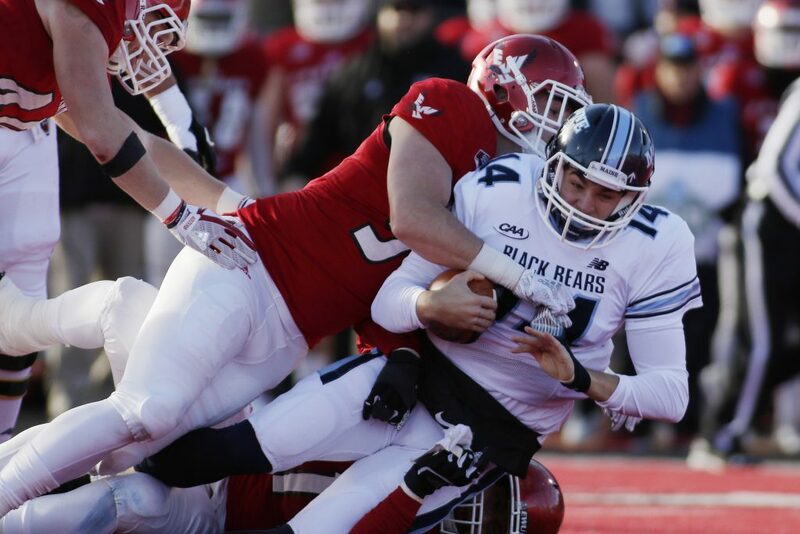 Eastern Washington defensive lineman Mitchell Johnson, left, sacks Maine quarterback Chris Ferguson during the first half of the Black Bears' 50-19 loss in the FCS semifinals on Saturday in Cheney, Washington. 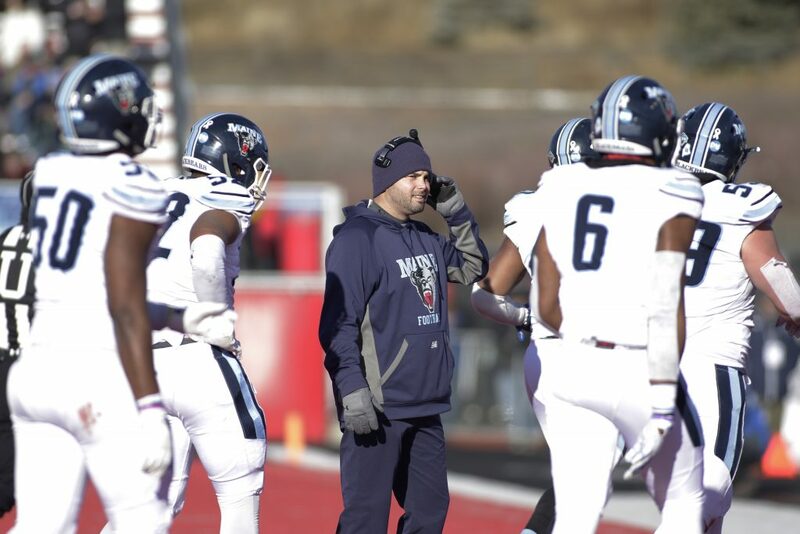 Maine head coach Joe Harasymiak, center, looks on as his players leave the field during the first half of the Black Bears' 50-19 loss to Eastern Washington in the FCS semifinal on Saturday in Cheney, Washington. 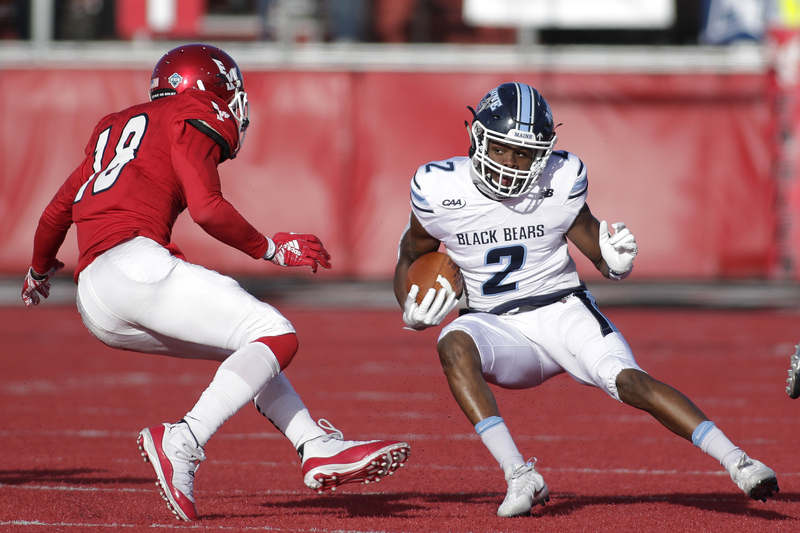 Eastern Washington wide receiver Nsimba Webster, right, drags Maine defensive back Darrius Hart into the end zone for a touchdown during the second half of the Black Bears' 50-19 loss in the FCS semifinal on Saturday in Cheney, Washington.